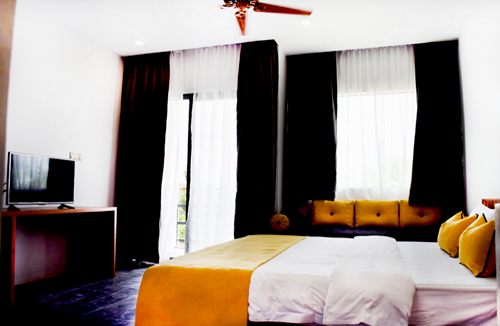 Sam So Boutique Villa - Boutique Siem Reap hotel - Good Rates Hotel in Siem Reap, Siem Reap Hotel & Accommodation Cambodia. Each room has a small private tropical garden to enjoy a cooling drink after your temple visits, as well as views out to the pool. The shower has a private view to the garden. Facilities include air conditioner, ceiling fan, remote control TV, mini-bar, tea/coffee making facilities. Children 3-12 year(s). Stay for free if using existing bedding. Guests over 12 years old are considered as adults. 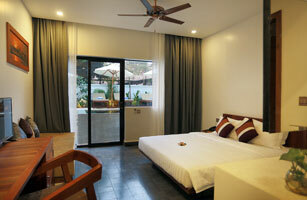 A spacious, airy room complete with extra large king size bed and balcony sitting area overlooking the pool. The full ensuite bathroom has a generous shower and a large luxurious bath.